Brookings Institution Press, 9780815704690, 144pp. 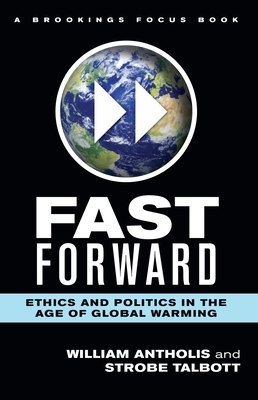 Fast Forward is equal parts science primer, history lesson, policy prescription, and ethical treatise. This pithy and compelling book makes clear what we know and don't know about global warming; why the threat demands prudent and urgent action; why the transition to a low-carbon economy will be the most difficult political and economic transaction in history; and how it requires nothing less than a revolution in our sense of civic responsibility. William Antholis and Strobe Talbott guide the reader through two decades of climate change diplomacy, explaining the national and international factors that have influenced and often impeded the negotiations. Their brisk narrative includes behind-the-scenes coverage of Barack Obama's impromptu meeting with key leaders in Copenhagen that broke a logjam and salvaged an agreement. The near-disaster of that summit demonstrated how the United Nations cannot move forward fast enough to produce a global deal. Instead, the "Big Four" of the United States, the European Union, China, and India must drive the next stage of the process. Antholis and Talbott also recommend a new international mechanism modeled on the General Agreement on Tariffs and Trade that would monitor national commitments and create incentives for other countries to coordinate their efforts to cut emissions. Antholis and Talbott put their recommendations for immediate congressional and diplomatic action into the larger context of our obligation to future generations. They note that this theme is stressed by a diverse coalition of religious leaders who are calling for ambitious political action on climate change. The world we leave to our children and grandchildren is not an abstraction, or even just a legacy; we must think about what kind of world that will be in deciding how live--and act--today.